East Yorkshire-based automotive group, Motordepot, has delivered a timely jobs boost to the Yorkshire and Humber region by securing a freehold acquisition of the old Go-Car car supermarket site in Scunthorpe. The 5.8 acre site in Mannaberg Way, which has been standing empty since early 2011, has been purchased for an undisclosed sum as part of an ambitious £2 million expansion programme which is anticipated to create up to 40 new positions across all areas of the business. Recognised as East Yorkshire's largest 'car supermarket', Motordepot has had a Scunthorpe presence since 2008, but wound down operations from a previous site in Mannaberg Way to facilitate the move to the new premises. Managing director, Steve Butterley, now expects the new site to be up and running before Christmas. He explained: "It's taken a little longer than anticipated but Motordepot is delighted to be back in Scunthorpe, bigger and better than ever. We already have a loyal following in the region but it has always been a strategic aim to expand our reach in the wider Lincolnshire area because, quite simply, we can offer deals which local dealerships cannot match." As well as housing a new, expanded Motordepot showroom with on-site servicing facilities, the site will also become home to the new Trade Centre Scunthorpe - a subsidiary of Motordepot which will specialise in selling 'main dealer quality' part-exchanges from £1500 upwards. Butterley is expecting Trade Centre Scunthorpe to prove a big hit with customers, having experienced huge success with an identical ownership model in Hull this year. "We have big plans for Trade Centre Scunthorpe. Through our phenomenal success in Hull this year, we know that there is a huge demand for the sort of 'one-stop solution' which Trade Centre Scunthorpe will provide. There is nowhere else in the area offering such an array of choice on main dealer quality part exchanges, so we are anticipating a big response." There could be a further exciting development in the pipeline with Butterley revealing that the acquisition of the new site has opened up new opportunities for main dealer franchising. Motordepot already operates East Yorkshire's only recognised Chevrolet franchise from its site in Hessle and there have been expressions of interest of doing something similar from the new Scunthorpe site. Butterley added: "We are already fielding calls from manufacturers regards possible future franchising. We have been thrilled with how our association with Chevrolet has worked in Hessle and we certainly wouldn't be averse to doing something similar at Scunthorpe...Watch this space!" The Scunthorpe site acquisition, in tandem with further expansion of its six-acre premises in Hessle, underpins a year of controlled growth for the Motordepot group and now gives it the capacity to stock around 1500 vehicles in total. And, with UK car sales recently hitting a five-and-a-half year high, buoyed by rising consumer confidence and attractive financing offers, Butterley is looking forward to 2014 with renewed confidence. "We are very happy with where the company sits right now, but won't be resting on our laurels. This is a fiercely competitive market and we remain totally committed to offering the high levels of service our customers demand and deserve." 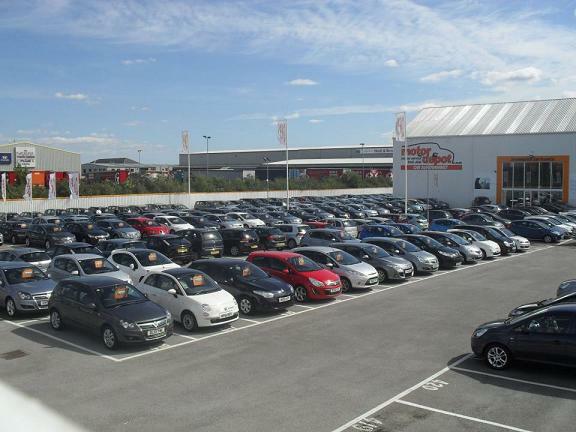 Motordepot are the leading Car Supermarket brand in Hull and East Yorkshire, with up to 800 cars on one huge site, although this will soon to be up to 1500 cars across 2 huge sites. We strive to Offer cars for sale at the most competitive prices in the UK. We sell a range of cars from brand new or delivery mileage cars, to ex fleet vehicles up to four years old ranging from £3,000 to £50,000. All our cars are prepared to the highest possible standards in our fully equipped service and MOT centre.